The theme of the stars, and Orion’s belt being stolen, came about from my older brother, who was into astronomy. He would get out his big telescope and stay up late into the night to watch the stars. He would point out the planets and my siblings and I, and let us look through his amazing telescope. The stars have always fascinated me. It makes me feel more grounded when I take a moment to look at the size of God’s creations. Also the idea behind Andrew’s powerful sword came about from my observations of what is going on in the world today. It seems that many people are taking their freedoms for granted and are willingly giving up their God-given freedoms for the promise of security. It is my belief that if more good men were willing to stand up for the cause of liberty, our liberties would not be so easily given away, and the world would not be under the dark shroud that is slowly creeping up on us. I can’t remember the exact date I decided I wanted to be a writer. Who I am, and what I love to do, reminds me of the new movie, “Alicein Wonderland.” I have always, been “Alice, or a writer” but the more I write, paint, live, and gain experience, the more, “Alice, or writer-like” I become. My mother has always inspired me to write, and to go after my dreams. She would read to me and my siblings almost every night when I was growing up. She read us wonderful classic books that are worth reading, stories that filled our heads full of characters worth emulating. Also, the messages I would like to share about being an author is to go after your dreams, whatever they are. I believe that every person on earth has an inherent gift planted inside of them that will enrich themselves and mankind, if they choose to nurture that gift. Just like a sunflower seed is born to become a sunflower—your dreams, and gifts, must be giving proper water, sun, and nurturing for them to grow and become what they are meant to become. Why did I start writing? Because I had so many things to say. Writing is an expression of communication, and while writing, I learned that I could face my fears, create new worlds without physical limitations, and tell truths that are sometimes clearer in fiction than in reality. It has been a ‘journey’ in every sense of the word. If any of you are familiar with the English term for the heroic cycle, that’s what my publishing journey has been like. First I started with ideas, and stories filling my head. I then embarked on writing the stories, once they were written; I faced the publishing dragon of rejection, rejection, rejection, over and over. Publishers saw merit in my work, but not enough to give me a chance. I got so many that I was literally afraid to open letters, because of the rejection letters that were surely waiting for me there. To this day, I think twice before I open a letter. Sometimes I even wait a while, and let the letter ruminate for good measure, so perhaps if there’s something not so nice inside the letter, it will become aged and softened with time. I also tried to get an agent, hoping they would get me into the doors of publishers. But agents are pretty tough to get, as well. Many agents are like authors who already have a big following, so I was stuck in a never-ending cycle of writing and, rewriting, sending off query letters, but never really getting anywhere. It was so frustrating! Writing is quite an invisible act. Your friends can’t really see the 500 pages you have on the computer. The ‘golden eggs’ are far and few between. I’ll tell you right now, if you want to become a writer, you have to be committed. You have to love to write. The act of writing makes you a writer. Don’t let anyone else tell you otherwise. Money, being published, and having people invest in your work, does not make you a writer, or an author. It makes you validated, it makes you feel good. But that is not why you write. You write because it is right. To make a long story short, I faced the publishing dragon only to realize that I needed to build a bridge over the dragon. I, against my inward critic, decided to ever so cautiously self publish. It was one of the best decisions I have ever made! By self publishing you put the power into your own hands. It’s scary. Yes. But you are not waiting on the system to tell you that you are a writer. You are giving yourself permission to be a writer. Yes, it’s scary. Yes there are lots of risks involved. Yes, you have to do ALL the work. Yes, your work might not be perfect. But if you do the best with what you have, you have done something that most people never dare to do. You have put something you created on your own out into the world. Yes there will be critics, and well-meaning people will scrutinize this bold act, and perhaps criticize. But that doesn’t mater. Most critics are dreamers who do not dare to live their dreams, because they are afraid of what others might say. Most critics are frustrated old artist who pull others down because they don’t have the courage to stand. So go after your dreams. Self publishing today makes the most sense. I read in an article stating that a lot of publishers are taking the digital rights to their author’s works. Plus, traditional publishers are taking a bigger cut of the royalties. All of which is not good. Not to mention, publishers are going to be tightening their belts, and will most likely be spending most of their marketing money on authors who already have a name. Apart from their editing service, and design and marketing team, self publishing has never looked better. With createspace, lulu, and lightingsource, smashwords, and kindle, there is every opportunity to be published. Will you make a lot of money? That depends on your book, how you market it. But remember, you’re not writing because of money, although that is a nice benefit. You are writing because you have something to say. Hmm… My favourite character is Gogindy, the whiskery Twisker who lives in a giant dandelion. He reminds me of myself. He thinks himself to be very clever, and important, as a cover for himself because he is very small, timid, and vulnerable. He tries to be out there and help, but sometimes gets in the way, and his good intentions sometimes get him into a lot trouble. He also likes to sing, dance, and he is also a bit mischievous. I am a little of all those things. However I don’t live in a giant dandelion. Is there a character in the series you think the readers will hate? I’m hoping that the readers will hate the bad guys, the Snake men, the Trolim, and the other villains who portray “Hate” and disregard for life. Bringing a story to life requires time, and dedication. All of which can be a challenge. Before I wrote the story, I made a very crude fantasy map, with locations and places my characters would travel. I also roughly outlined details to each character, what colour of eyes they had, what they liked or didn’t. Also, I had a difficult time figuring out which characters to keep, and which ones needed to die. I had so many. In the end, I kept quite a few, probably more than I should have. But perhaps in the next book, I’ll let a few go. It’s hard being the executioner of your characters. There were a few difficult chapters. The hardest part was finally just saying hey, book, I think we better send you off. It’s time to move on. It’s scary putting your work out there for others to read. But at the same time, it’s very exciting. Oh yeah. Formatting pictures into the paperback book was a real nightmare. It took me months to get the pictures to stay put. Microsoft word is really a pain when it comes to messing with pictures. Also, editing a big book is quite tedious. I don’t know how many times I went through the book, and still found some typo I’d missed. It’s like an ugly mark on your baby. You want your story to be the best it can be. Even after having others look through it, I know there are some things I missed. But there comes a time when you do the best with what you have, and hope that the story will shine through, regardless of your human errors. Even major authors, I’ve found, have bloopers in their books. It always makes me happy when I find them. It proves that a human wrote it, and not a machine. Also I had a hard time writing the Dragon Firefly chapter. I don’t know why. I rewrote it over and over again. I’m still not satisfied with it. But eventually you have to let it go. I designed the cover for my book. I love illustrating! It’s a lot of fun, and a lot of work. I designed dozen’s of covers for this book. But for some reason or another, I wasn’t satisfied with the end result. Each cover I designed led me closer and closer to the one that I wanted to use. When I finally settled on the one cover, it finally felt right. That was such a nice feeling. I learned a lot about how what works in a story, and what doesn’t. I learned that the rows of books you see in the library have had hours, and hours of work put into each one. I learned that talent is good, but you also need dedication to finish what you start. Most importantly, I learned that believing in your dreams enough to invest in them is far better than just waiting for some magic fairy “Godmother” to turn you into a princess. Why did you choose a pen name which is also the name of a character in the book? Is the character of Ivory Autumn based on you? I have always wanted a pen name. I thought it would be fun to have one of the main characters in the book be the writer of the book itself. The character Ivory is like me in some ways, others not. My dad suddenly deciding to leave my mom hit me really hard. I mirrored those same emotions in Ivory, and her feelings of abandonment in the chapter of the Foglocker. Also I chose a pen name, because there is something primeval and fun about having a second identity. Also I wanted a name that would evoke an image. Ivory, reminded me of white, and Autumn, reminded me of red leaves. I would get a professional editor, if I could afford one, and then I’d hire someone to mess with formatting. That way I could spend all my time writing. I was stuck a few times. But not stuck stuck. I had a lot of brain hiccups. Sometimes I came to a spot in my story where I had to just rethink the whole thing. I like to hula hoop to music, so that is where a lot of my thinking, and rethinking got done—- not to mention my long walks by the river helped me to plot out my story. I’m just really excited. This whole series has been a lot of fun to write—writing fantasy is a playground for my imagination. This next book, The Canvas War, has got Brittlewambers, talking mushrooms, living wind, an artist who can breathe life into his paintings, captive prisoners, and a kingdom that is at war with itself. The Canvas War is full of battle, intrigue, excitement and adventure. I’m still working on the book. So I’m not going to give an excerpt at this time, because it might change. My family hates it when I do that. So I’m not going to confuse you with a potentially morphing excerpt. Danspire is entering its dark age.Libertyis forsaken in the name of security. The power of the Fallen is rising, threatening the freedom of every living creature on earth. Shadows are gathering to the Shade, preparing for battle. The stars are growing dimmer. Yet a light shines. Even when Danspire rejects their rightful king, Andrew stands firm in his task to summon 500,000 people to fight for their liberty. Freeing slaves in their wake, braving the mushroom forest, the living winds, and an evil Ragweed, Andrew and his friends seek refuge in the city ofRomrook, only to battle for their lives and the lives of their countrymen against Morack’s huge army. Join Andrew in the sequel, The Canvas War. I have so many favourite books. I’m not sure I could pick just one. I love The Secret Garden. I also really enjoyed reading, Joan of Ark, By Mark Twain. I really liked Ivanhoe, by Sir Walter Scott. I love the Dr. Seuss book, “Oh the Places you’ll go.” Also I really like Jane Austin’s Pride and Prejudice and the book called, The Scarlet Pimpernel – I can’t remember who wrote it. Also I couldn’t go without saying I love S.C Lewis’s Chronicles of Narnia, and Tolkien’s LOTR series. As of this moment, I’m actually just mostly writing books. Yeah, kind of boring. If you have any good book suggestions, I’d love to hear them. I was born, not breathing, with gunk clogging my lungs. But due to the doctors know-how I am alive today. Happy for me. I was home schooled for pretty much my whole life. I wouldn’t change it for anything. It has given me a fresh perspective on life, freedom to think, and permission to explore and see things in a different way. I have a hidden identify as a psychologist. No, I didn’t study to be one. It just happened. Ever since I was little, my friends would divulge their deepest secrets to me. At first I thought it odd. But now, I realize that with so much talking going on in the world, people really miss out on a lot of good stories. One of people’s greatest desires is to be heard and understood. Everywhere I go, mouths with hopes, dreams, failures, and triumphs, big and little secrets, find me. I find perhaps, that is because I listen, and watch the world, emotions, struggles, stories and characters take shape in my mind, and my writing becomes more real because of it. Note that I don’t love to talk as well, and I am by no means a fantastic listener. I just find that when one stops to listen, even in nature, or to pause on a busy sidewalk, and take a space away from busy life, ordinary life experiences, the people you meet, and the places you go take on new, extraordinary meaning. Don’t let anyone define who, or what you want to do with your life. Go after your dreams, be passionate, persistent, and be true the real you. Obstacles are what make you stronger, they make you more of who you are if you choose not to let them stop you. Once you start to live your dreams it gives permission for others to do the same. You may think that you’re not unique. But you are. There’s no one on the whole earth just like you. 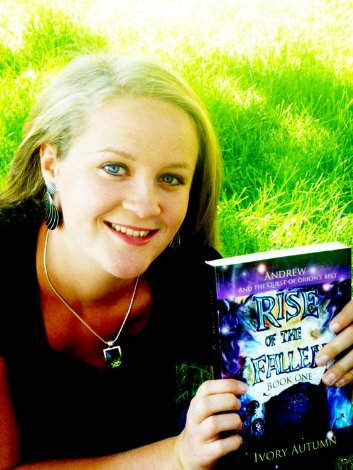 I’m doing a giveaway On 10th, and 11th of February (Friday and Saturday ) I’m giving away my fantasy ebook, “Rise of the Fallen,” for free for two days on Amazon. The only thing I ask is for people to download my free ebook, and then share my Amazon ebook link on Facebook with their friends. 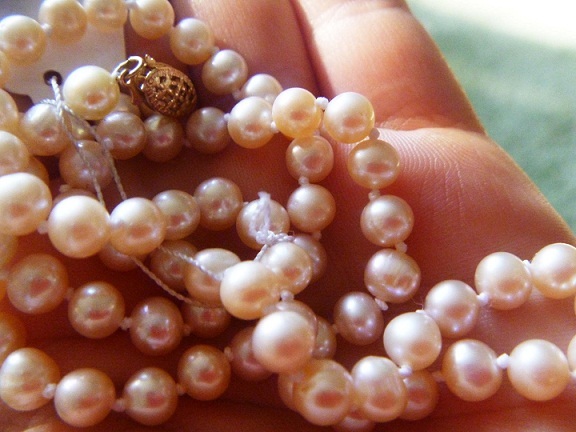 Once you do that, just send me an email at: junesbugs@hotmail.com giving me your name and email stating that you downloaded the book, and shared it on Facebook, and I’ll enter you in a drawing to win a genuine pearl necklace, with a 14k gold clasp. The winner will be announced on my blog as soon a winner is picked. You can find my book on Amazon here . Ebook you can’t get a paper cut. But Paperbacks rule! I’m not sure. Sometimes I admire the fact that cats don’t bark and growl at strangers, nor do they try to knock you over and lick your face. On the other hand, dogs are awesome protectors. One time our dog saved one of our cats by barking and barking to get our attention. Our poor cat had its head stuck in something. I can’t remember what it was; all I remember was that the dog caved the cat. I think cats are good for play dough, they mould pretty much into any shape. So each has a pro and a con. I don’t drink coffee. Herbal tea is best. Oh I have so many. Sweet n sour Chicken/rice, jalapeno five topping Pizza, homemade cheese cake, and Greek God’s yogurt. Yum. Myself. It would be hard to leave home without me. Real vanilla caramel ice cream. YUM! I generally like writing in the morning. I like to be fresh when I write, without any baggage of the day weighing on my mind. But honestly, life happens, the phone rings, people need help, urgent family problems surface, animals need to be fed. What I’ve learned about writing is that you must not wait for the perfect time to write. The way I write is like doing a patchwork quilt. I cut a bit of time off here, and sneak in some there, and bit by bit, a novel forms. Where do I write? I have to be alone to write, preferably in my upstairs bedroom, on my laptop, listening to movie soundtracks. If I’m away from my computer, I also like to jot little ideas that come to me, on pieces of paper I might have with me. Or sometimes if I have a cool thought or idea, I sometimes scribble something on a note by my bed. Ron Paul, because he’s an amazing person who believes in liberty, the constitution, and restoring America, plus he probably wouldn’t try to make me into slave. Thomas Edison: Gotta have light. Marry Poppins. She has everything anybody could need stored in her small little purse. I have so many favourites. It just depends in the mood I’m in. Right now, what comes to mind is: Forever Strong, Black Beauty, The Matrix trilogy-edited. The fates of some are written in the stars. Andrew’s was written before the stars were. All ANDREW GRIGGS had anticipated on the day of his sixteenth birthday, was to grow one year older, and perhaps wiser. However, with it came death, fire, slavery, and whole new identity. Gifted with a compass, a cryptic letter, and a map, questions about Andrew’s past, his future and his true lineage haunt him. Forced to work in the dark mines of Nookpot, alone, with only his friends, TALIC and FREDDIE, for company, Andrew risks his life to save dozens of slaves like himself, only to be thrown into a confusing web of trouble, and incriminated as a killer. A plant killer, someone who could cause famine, destroy entire crops of grain and turn giant trees into sticks of dry wood. Sentenced to death, Andrew discovers life, new purpose, and a chance to prove his worth. With freedom hanging on the verge of extinction, Andrew sets out, with the help of his friends, to keep a fallen star from heralding in the darkest age of history known to mankind. 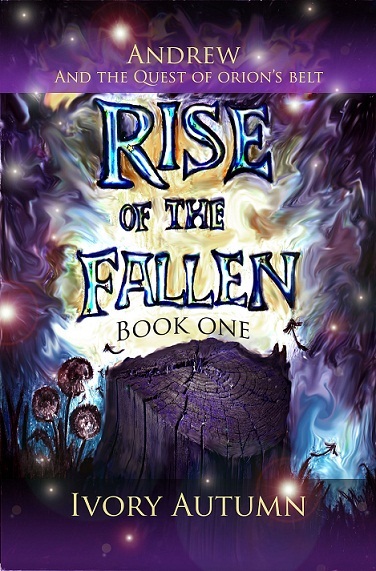 Rise of the Fallen, is an exciting tale, where light and darkness teeter in the balance, and a legend of epic proportions unfolds as the summoning begins. Ivory Autumn is a young elf who enjoys ice-skating, swimming, cheesecake, noodles, hula hooping, and exploring tree houses. Her favourite colour is purple, and her preferred shape is a circle. She likes the smell of cinnamon, and the sound of feebee bugs clicking their wings at night. She doesn’t like carrots, getting slivers under her fingernails, radishes, blustery wind, doing moldy dishes, or stepping in cold puddles with fresh stockings on. If she were to be any kind of fruit, she would be a mango, because they are so yummy. She likes watching lightning, springtime, tall trees, and having butterflies land on her nose. This entry was posted in Author Interviews and tagged Andrew, author interview, Fantasy, Ivory Autumn, Orion Belt, Quest of Orion's Belt. Bookmark the permalink.